Gavin and I enjoyed a relaxing weekend in Palo Alto. We drove down early Saturday morning and drove home Sunday evening in time to see the sunset as we drove across the Golden Gate Bridge. By “we” I mean I drove and Gavin got to enjoy the sun set. Gavin let me know exactly how much of nature’s beauty I was missing, and how lovely the scenic views from the bridge were. The weekend was nice, and oddly relaxing. We had lunch with Abby and Mark, got our car washed, watched Megan play soccer, and discovered the spots on our car were calcium hard-water deposits. Stephen throughly enjoyed the chocolate chip toffee walnut cookies and cinnamon pecan sticky buns, and Dulce brought out an amazing array of plates and platters that could be options for Thanksgiving. Megan had the SAT Saturday morning, soccer that afternoon and lots and lots of homework the entire weekend. Sunday we loaded our car with a variety of items that my in-laws were happy to send to a different home. 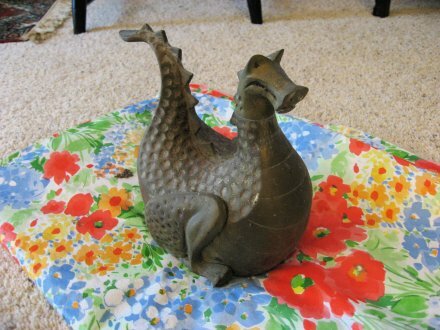 A warming plate, baby-bunt pans, art, place-mats, and a funky dragon humidifier. I saw the little dragon next to a collection of flower pots and asked if he could come live in our garden (I thought he was garden art), Gavin got quite excited when Stephen said “yes” and went on to explain it was NOT in fact garden art, it was a humidifier. You fill it with water, put it on a wood-burning stove and steam blasts out his nostrils. When I first told Gavin I wanted to clean the little dragon up, he expressed concern about the patina and the dragon losing it’s “character.” I was less concerned about character and more concerned about what it had been exposed to during it’s time living on the drive way. This morning I gave the little dragon a rinsing, then a light soaping and more rinsing, followed by a good deal of brass polish, and more rinsing and buffing. Fortunately, I bought some cotton gloves and extra cleaning cloths at the hardware store this morning. Two filthy cleaning cloths, incredibly black gloves, and a good deal of brass polish later, you can now see a distorted reflection of yourself in the dragon’s expansive stomach. 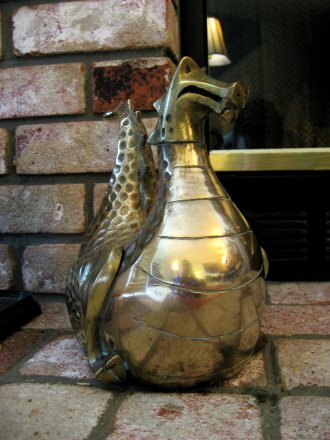 The little dragon has taken up residence near the fireplace across from the cat. He is quite the character and livens up the living room (and he’s quite the contrast to the regal looking cat). Puffy looks fantastic. We had a great weekend. Thanks for coming down.